The International Maple Syrup Institute held their quarterly Board of Directors meeting at the Holiday Inn in South Burlington, Vermont on Thursday February 7th, 2013. The meeting was well attended by IMSI Directors, IMSI members and guests. This summary is being provided in advance of more detailed formal minutes from the meeting, which will be distributed later. A listing of the 2013 IMSI Board of Directors is posted on this website. Effective February 2013, Simon Trepanier has replaced Ann Marie Granger-Godbout as Director Representative for the Quebec Federation of Maple Syrup Producers. IMSI Treasurer presented a quarterly financial report for the IMSI Board which was accepted by the Board without amendment. An annual audit of IMSI’s financials was completed and all aspects of the financial review were found to be in order. The IMSI Board of Directors accepted the IMSI Audit Committee report. Dave Chapeskie led the discussion regarding fund raising needs. A number of specific fund raising options have been explored since October 2012. These included a proposal to partner with one or more equipment and supply vendors to sell IMSI’s maple nutrition resources and another which would involve advertising on the IMSI website. These ideas continue to be under consideration. Dave Chapeskie recommended that the IMSI develop a strategic framework for fund raising which will be helpful in the assessment of individual fund raising proposals. Dave will follow-up with Mark Harran and David Campbell. IMSI Board of Director representatives from both Canada and the United States reported on the status of maple syrup supplies, markets and sales in their respective jurisdictions. In general, the supply of maple syrup remaining with maple producers in the different states and provinces is limited and market demand has been stable or growing, depending on the jurisdiction. The commercial maple syrup industry has been growing in recent years in a number of states, notably Maine, Vermont and New York State and this growth is expected to continue. Some jurisdictions such as Connecticut, New York State and Ontario are investing energy and resources in assessing the potential for growth of the industry in their respective jurisdictions. Simon Trepanier of the Quebec Federation of Maple Syrup Producers reported that negotiations to set the prices for Quebec’s bulk syrup in 2013 had not yet been confirmed. It was expected that prices would be +- 2% of the bulk syrup prices set for 2012 when the average price for all classes of syrup was $2.81. Based on discussion at the IMSI Board meeting, it is expected that bulk prices for AA, A and B classes of syrup would not change from the 2012 price levels , but the price for C and D class syrup may decrease somewhat. Simon advised the Board that there were an estimated 44 million pounds of syrup in reserve with the Quebec Federation. There was also some discussion regarding the 2012 case of allegedly stolen syrup from a Federation warehouse in Quebec. It has been reported that police have apprehended all or most of the people responsible for this heist and follow-up is in the hands of police and the courts. Simon indicated that about 6 million pounds of syrup was involved in the heist. The IMSI has facilitated the testing of syrup samples in the international marketplace that have been suspected as being adulterated for many years now. All IMSI members are strongly encouraged to take advantage of the IMSI’s adulteration testing assistance if they suspect that syrup is adulterated anywhere in the world marketplace. Over the past year, the IMSI has been reviewing their protocol to facilitate adulteration testing of syrup. Beginning immediately, all Canadian IMSI members who wish to submit samples of syrup for adulteration testing through the IMSI sponsored program, must send the samples to Yves Bois of Centre Acer who will facilitate laboratory adulteration testing of these samples in Canada. All US IMSI members should continue to submit syrup samples suspected of adulteration to Tim Perkins at UVM Proctor Maple Research Centre who will continue to facilitate laboratory testing of samples in the United States. This arrangement will circumvent issues with moving related syrup samples across the US-Canada border and may increase IMSI member utilization of IMSI’s adulteration testing service. The services offered by the laboratories to be utilized in both Canada and the United States have been judged as satisfactory to complete this work by Tim Perkins, Yves Bois and Dave Chapeskie. Details required for submitting samples for adulteration testing will be posted on the IMSI’s website by Friday March 15th or sooner,if possible. Henry Marckres and David Marvin provided an update on the status of Pinnacle Food’s Log Cabin Product. It was mentioned that an independent lawsuit was filed in Vermont against Pinnacle Foods regarding use of the term “all natural” as well as for use of the traditional maple jug design. In some markets, Pinnacle has apparently dropped maple syrup from the ingredient listing. While the IMSI has been active in follow-up on specific labelling claims, a growing number of IMSI members are asking for the IMSI’s position on labelling different products containing maple syrup. Examples of these products currently in the marketplace include blueberry maple syrup and vanilla infused pure maple syrup. 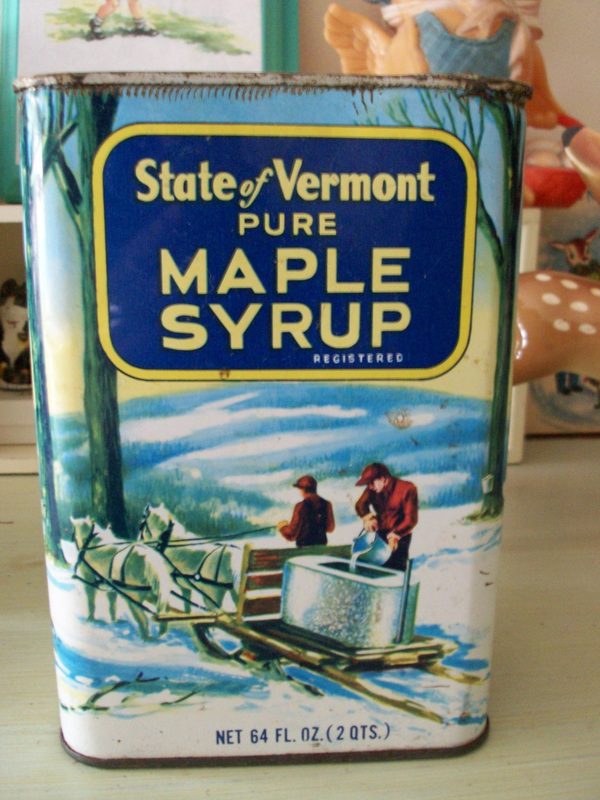 It was agreed that Dave Chapeskie would work with Eric Prud’Homme, Henry Marckres and others as required to consolidate information pertinent to labelling products containing maple syrup in Canada and the United States. The IMSI will also input into proposed regulatory amendments affecting the labelling of products containing maple syrup on an ongoing basis. There was discussion regarding the importance of maple producers remaining vigilant regarding food safety and quality issues. All maple syrup producers are strongly encouraged to adopt best practices for the production of maple syrup and other pure maple products. A critical aspect of this is to take steps to avoid potential sources of contamination in all phases of maple syrup production and packing. There are some excellent references and resources available to help producers and packers. These include, but are not limited to, the IMSI approved Maple Equipment Manufacturers Guidelines (equipment standard to avoid contamination) as well as provincial and federal quality assurance programs or regulations in the United States and Canada. A very important part of our industry product brand is that maple syrup destined for retail markets is pure and of high quality. Since the February IMSI Board of Directors meeting, there have been reports that some producers may be unknowingly purchasing formulations of iso-propyl alcohol to use as a sanitizer which is not food grade or food approved. Some non-food grade products could represent a safety hazard to consumers and potentially result in contamination of maple syrup. This example spells out the need for ongoing vigilance to ensure that maple syrup is not contaminated in any way. Government Agency officials such as representatives of the Canadian Food Inspection Agency and the Vermont Agency of Agriculture, Food and Markets should be consulted if there are related questions regarding the suitability of equipment or supplies used to produce and pack maple syrup. The FMSA and its significance to the maple syrup industry was discussed. The Executive Directors of the IMSI and North American Maple Syrup Council have worked cooperatively in interpreting the requirement with input from Mark Harran, Winton Pintoff and others. The intent of both the IMSI and NAMSC was to help interpret implications and requirements of FMSA to the maple syrup industry and to share this information with maple syrup producers and others. Please contact Mike Girard, NAMSC or Dave Chapeskie, IMSI, if you have questions or require information on FSMA. Dave Chapeskie assisted by others report on the status of the IMSI’s Standard International Grades initiative. Progress is being made in moving the IMSI’s proposal through the regulatory process at the federal level in Canada (CFIA), United States (USDA), Vermont and New York State. Other state and provincial regulatory agencies, while generally supportive of the changes proposed by the IMSI, are awaiting additional progress at the federal level to assist their approvals process. For example, Ohio’s regulatory agency representative indicated that the state would be adopting the changes once they have been accepted by USDA. Recently, the IMSI has requested that CFIA and USDA officials provide a formal update to all states and provinces that have their own maple regulations regarding federal level progress on moving the IMSI proposal through the regulatory change process. This will help ensure that the overall regulatory change process is coordinated to the greatest extent possible.Federal and state/provincial government regulatory changes are expected to be in place for 2014. Once approvals are obtained, it is anticipated that government agencies will allow for a transition period between the current grading systems and the new grade standard. Expressions of interest in production of the new colour classification system kits to-date include Centre Acer, Vermont Sugarmakers Association, Atkinson’s Maple Products (Ontario) and Lovibond International. Centre Acer and Lovibond have already produced kit mock-ups to accommodate the new colour classification and grade standard. Ray Bonenberg reported on the resources, which are now available from the Executive office of the IMSI. These include a bilingual rackcard, French and English posters and an information CD. The CD contains a camera-ready copy of the rackcard and poster, a copy of most nutritional and health benefits scientific papers and other related information. Ray mentioned that the IMSI’s purpose in developing and providing these materials is for awareness and education purposes. He indicated that it is permissible for IMSI members, including their individual maple producer members to utilize the camera-ready files to duplicate the materials, as some IMSI members have already done very effectively. IMSI members may add their own business identifiers to the poster and rackcard as long as the information content and inclusion of the IMSI logo on the resources is not changed. The IMSI also has a limited number of printed rackcards and posters for sale and anyone interested should contact Dave Chapeskie for further information. It is noted that the complete IMSI nutritional and health benefits information developed by the IMSI, including the rackcard, poster, IMSI position statement as well as access to scientific documents are accessible on the IMSI website. The Executive Director of the American Products Research Foundation (APRF) provided the IMSI Board with some background on the organization. It was agreed that Dave Chapeskie, Jacques Couture and Simon Trepanier would discuss the possible merit of an IMSI partnership with this organization and follow-up with APRF’s Executive Director as appropriate. Dave Chapeskie mentioned that the IMSI continues to sponsor two awards annually, the Golden Maple Leaf Award, which recognizes innovation in the North American and International Maple Syrup Industry, and the Lynn Reynolds Memorial Leadership Award, which recognizes outstanding service and accomplishments of an individual for the North American/International Maple Syrup Industry. It was agreed that the 2012 criteria for the two awards would apply without amendment in 2013. The IMSI members are strongly encouraged to submit nominations for the two awards to the IMSI’s Executive Director no later than August 31st, 2013. Specifications for the two awards are appended to this summary and are posted on the IMSI’s website www.internationalmaplesyrupinstitute.com. Henry Marckres reported on the IMSI sponsored maple grading school. Participants in the schools continue to greatly value the educational experience offered. Henry mentioned that there will be three school offerings in 2013 in Cornwall,Ontario (July 9th and 10th) and in Fairfield,Vermont(October 4th and 5th) . If additional information is required please contact Kathy Hopkins at 207-474-9622 or khopkins@maine.edu. Deadline for Registration is October 12th, 2012. The 2013 Annual NAMSC-IMSI Meetings will be held from October 21-24th at Delta, Beauséjour, Moncton, N.B. The IMSI Annual General Meeting will be held on Thursday, October 24th. For further information, contact Yvon Poitras at yrp@nb.aibn.com.